I studied economics and globalization at a unit of the University of London for the 2012-2013 term in an MSc. program there. Among my takeaways was a greater appreciation for academics and their research, which relies more on facts and data than most other sources of news. Another takeaway was to see more clearly that certain popular sources of news are often more biased than academics, rely less on facts and data, and more on the political/economic stance of the publisher. On the conservative side, there is the Wall Street Journal and The Economist, both solidly supportive of the free and uninhibited private market and generally critical of government rules and regulations–usually lining up squarely with Republican agenda–at least that was true before ultra-Conservatives hijacked the Republican party and moved it to the outer edge of Conservatism. Along with this goes a hawkish stance on global conflicts and extreme austerity in government fiscal policy. We actually need another word for this sets of positions…lunacy? A strong recommendation against Benyamin Netanyahu in his race against Yitzhak Herzog in the vote tomorrow for Prime Minister of Israel. “Bibi” Netanyahu has just returned from his controversial gleeful reception by Republican members of Congress who share his hawkish views on Iran and Palestine. The Economist recommends Herzog. In a continued criticism of excessive austerity imposed on England by George Osborne, the Chancellor of the Exchequer, The Economist says, “The shabby truth […] is that the success of Mr Osborne stems from the goals he has abandoned, rather than the guns he has stuck to. And next week, unless his budget plans are more apt, Britain risks paying a heavy price.” The Economist favors less austerity. 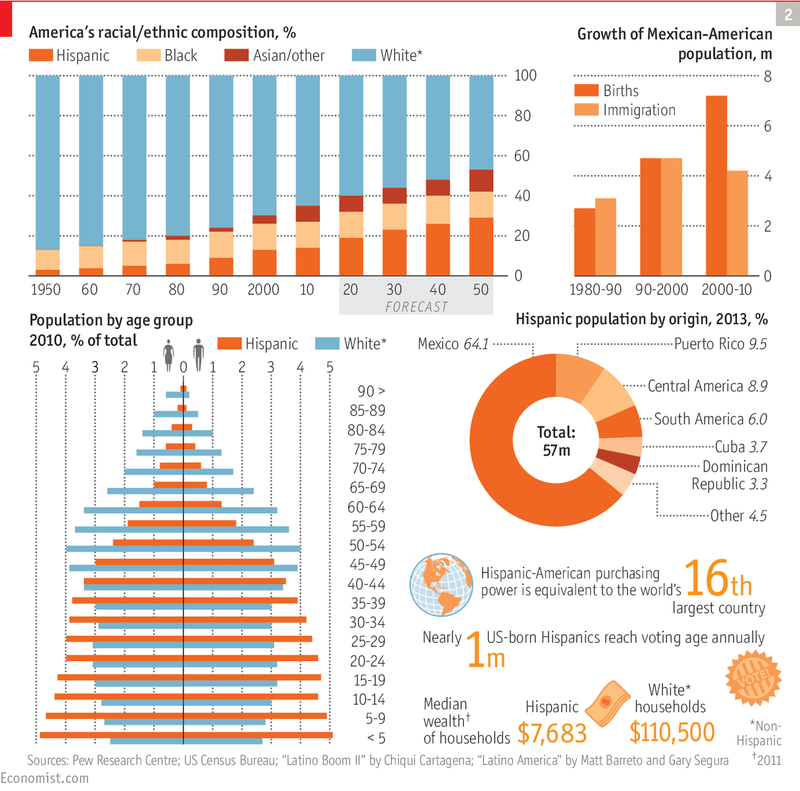 A strong argument in favor of the US embracing its growing Latino population. I’m choosing this one to highlight below. The blindness of Conservatives regarding Latinos is particularly troubling. Latino growth is where most of their immigration resistance is centered–it’s mostly about Mexican illegals, and then about Mexican legals and then about immigration in general. The popular refrain is appealing to jobs lost to immigrants–legal and illegal. It would seem more consistent with liberal vs. conservative for Democrats to be worrying about jobs (including jobs taken by immigrants), but most of the noise now comes from Republicans. Face reality. Latinos number 57MM of our 321MM in the US today. Without immigration, the Latino share will rise, due to their higher birth rate. Every year 900M Hispanics born in our country reach voting age. Republicans are way behind in popularity with Hispanics. There are issues in dealing with this surge, both real and perceived, but much of it centers around the near poverty and often uncertain status of Hispanic families. This can be seen in somewhat higher crime rates, lower graduation rates, and higher teen pregnancy rates in some Latino communities, but the data shows these trends are improving for Hispanics. For example, a Pew study finds that US born Hispanics take a significantly more negative view of teen pregnancy than do their foreign born counterparts. We need to provide for more and better education opportunities for our young Hispanic population. We need their developed skills in our advanced workforce. They need not be destined to work in the kitchen, in cleaning, or in the garden, only. There is no good reason to believe our Latino population brings with it less ability than our German or our Irish or Italian. We are incredibly fortunate to have this younger population of hard working people joining our workforce and our communities. Republicans, of all people, should see the economic benefit of this huge and growing wave of potential for our culture and our economy. We will need to aggressively embrace these entrants with support in education and rights to take advantage of the opportunity. If we do, we will all benefit. Instead of “taking our jobs,” they will be growing our economy with the young energy and we have all the more jobs to go around. In my previous post, I highlight one example of success in supporting the underprivileged in the Latino population–a private school in East Palo Alto, where the majority of students come from poor Hispanic families, and where 100% of this high school’s graduates are going to college and graduating from college–vs. an 11% college graduation rate for first generation students nationwide.